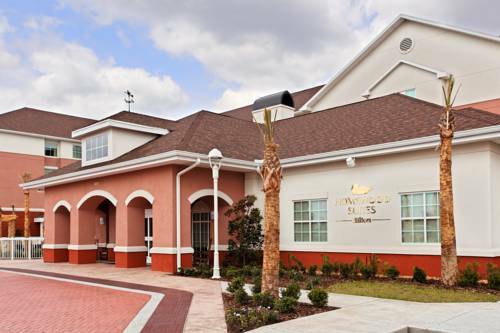 THIS HOTEL IS 100PCT NON SMOKING Feel at home at the Homewood Suites by Hilton Orlando Gateway/Orlando Airport. Our extended stay hotel offers a choice of studio one or two bedroom suites. Stretch out on the sleeper sofa in the separate living room. Prepare a meal in the fully equipped kitchen featuring a refrigerator microwave two burner stove top and dishwasher. Catch up with work at your work desk. Be entertained with a 37 inch LCD flat screen TV in each bedroom room with premium cable channels. Non smoking and accessible rooms are also available. Begin your day with a complimentary Suite Start hot breakfast every morning. At the end of a long day unwind at our Welcome Home Reception served Monday through Thursday. Connect with your office or family while you*re on the road with the on site business center and complimentary high speed Wired and Wireless Internet access. Work out in our modern fitness center or enjoy a friendly game on the outdoor sport court. Melt away stress in the outdoor pool and relax in the evening by the outdoor fire pit.